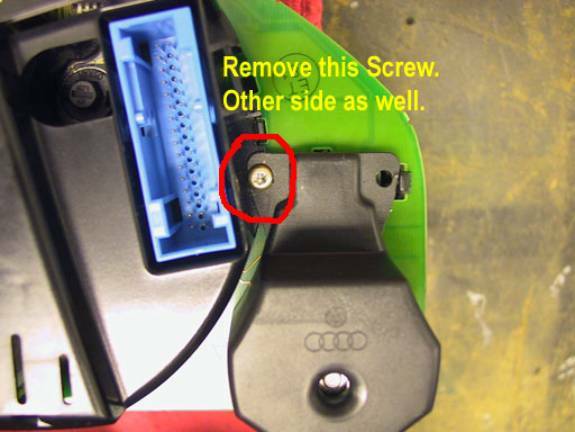 Dont let the Audi garages fool you, the whole cluster does not need changing. Mine did exactly the same thing, worse on hot days, better on cooler days. Audi also said change the cluster, I thought forget it! I took it out, there's 3 plugs on the back. Turn it over, there's a few torx screws, take those out, and loosen the black clips which hold the clear face to the rest of the cluster. What happens is the lcd display glass has a thin ribbon cable on its right hand side that powers the display, the bonding/glueing on this ribbon cable comes loose, doesn't make proper contact thats why the lines come and go. Over the top of the display is a metal cover plate held on by 4 legs bent on the back of the pc board. Straighten these, and it comes off. WORK GENTLY!!! Then you can remove the lcd glass. Be careful, don't loose the 2 pieces of plastic behind the lcd glass. IT WILL NOT WORK WITHOUT BOTH OF THESE. Then, either take the lcd panel to a good electronic company to re-bond the ribbon cable for you, or find a place that makes and sells lcd displays. Don't worry about the codes either, so long as you disconnect the cluster with the ignition off, once you plug it back, everything will work fine. I did mine myself, just added 2 extra strips of thin rubber strip behind the lcd on either side, and made the metal cover press down slightly harder on the ribbon cable so it makes better contact, and it works perfectly. All in all, an hour or so's work. 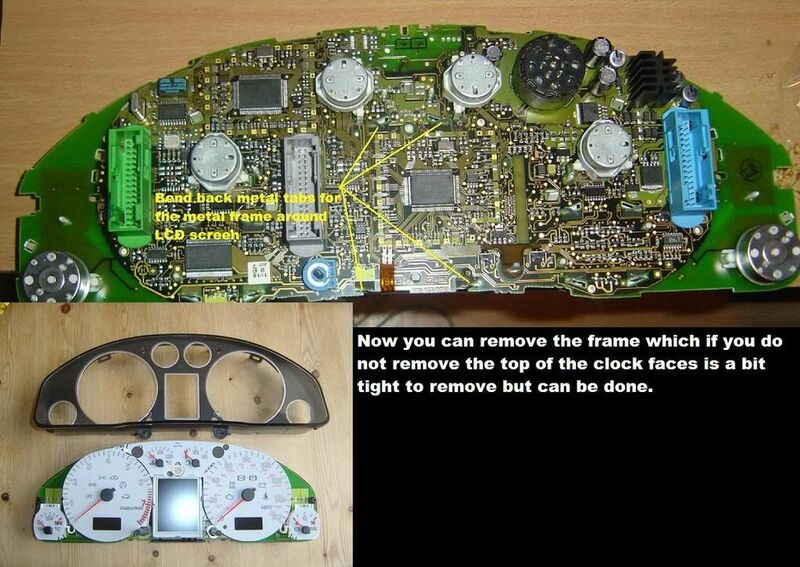 Actually not difficult either to remove the clocks. Loosen the steering column adjusting lever on the left, pull it towards you and down, (you are going to need all the space you can get) tighten it again. On top of the column right underneath the clocks is a small plastic cover, grab it and pull at it, it comes out relatively easy, there's no screws holding it in. 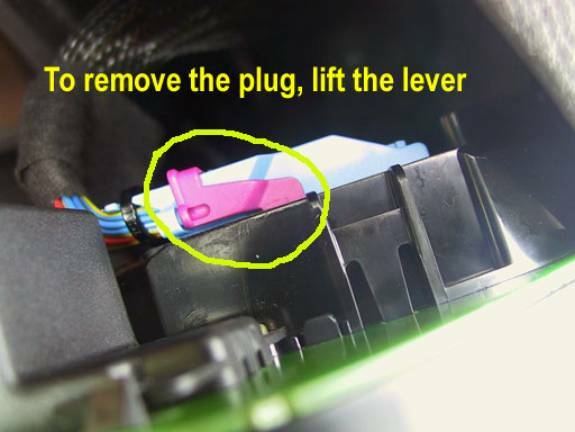 On the top of the cluster, is 2 x Philips screws, take these out (It helps if you have a very short screwdriver, it just a very difficult and tricky place to work). Then, pull at the top of the cluster, you should be able to get a finger in right at the top, and its not too difficult once you've got it loose. The plugs are difficult to get out, they are held in place by clips which fold over then clipping into place, almost like a stirrup. Do the closest one to you first so you can see how it works. Unclip it on the sides, then push it up and over the plug, this will actually lift the plug out of the fiiting, then its just a simple case of moving the cluster around till you can get it out. 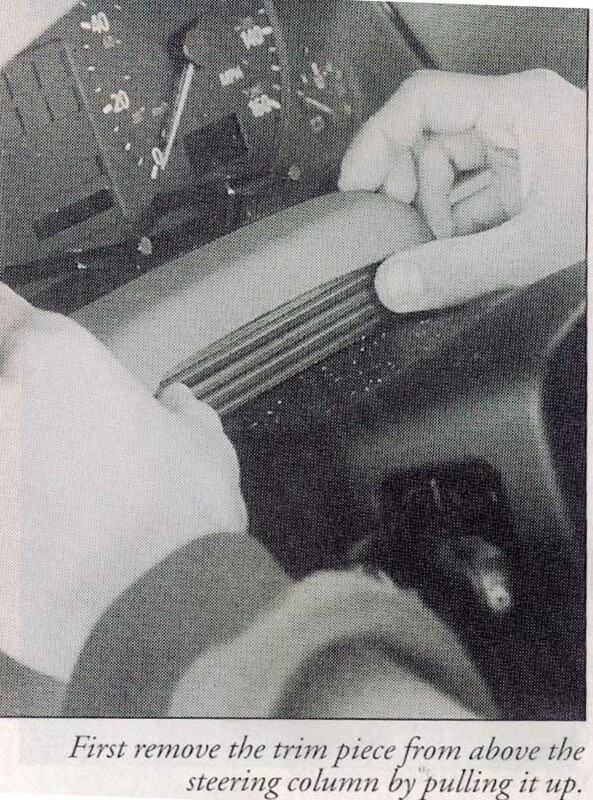 Step 1: Take out the instrument cluster. 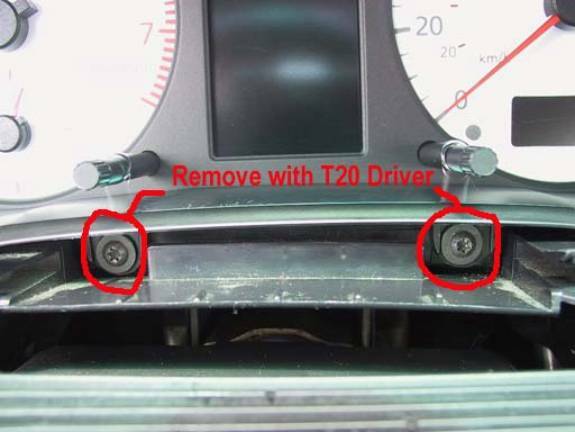 Step 2: Disconnect the plugs. 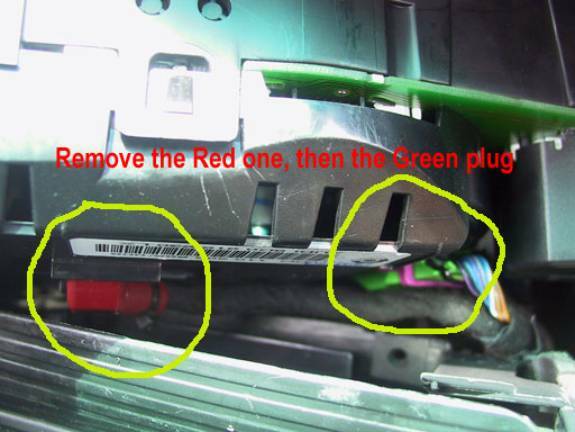 Step 3: Remove the remaining plugs. Step 4: Remove the cover. Take out the screws and snap open the cover.